If you suffer from heart disease, beware your condition while you are climbing up on the Great Wall. I discovered on another translator it meant "thunder weather prohibited to smack cellphones"
All your grammar are belong in toilet. 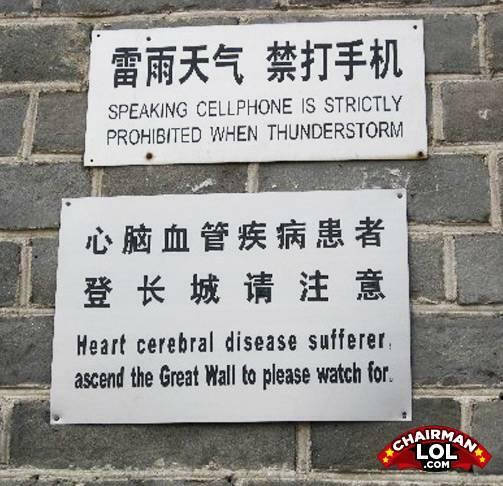 Ascend the great wall to watch for the evil heart cerebral disease sufferer. Cant speak on phone, but if i got heart desease I gotta climb the wall! AHH. Speak like yoda, you can, too. Yes, hmmm. Would you do any better writing or speaking in their language? I HATE THE PERSON ON THE BOTTOM!!! !